Why is it that part of our New Year rituals includes making resolutions, cleaning up/out, and dieting? One of my favorite things to do is to take my old calendar and move important dates to my new home calendar. I think it gives me a sense of continuity and hopefulness. I put in all the set dates like birthdays and anniversaries; I move over the appointments we had written in at the bottom of the December page in anticipation of the "new" calendar. Of course I put such BIG work events as the CEC convention (April 9-12) in Philadelphia and ALL the CASE events ( Hybrid- Feb. 24-26; CASE Legislative Leadership Seminar-July 13-16; Fall Board of Directors Meeting- November 12-13 and the Fall Conference-Nov. 13-15). I put in our "set" vacation plans and dream of those fun times. This year I have a little less to do as one of my Christmas gifts from our youngest son Wiley and his family was a calendar with all the family dates already listed and each month had pictures of our family — I almost hate to hang it up as it is like a great scrapbook of 2013! I bet you have spent some time reflecting these last few days — I hope you spent it reflecting on your family, friends, your own health, and ways to be good to yourself and others. For many of you, today is your first day back from the holidays — some of you had to work a couple of days last week. However, many days you had during the holiday break, I hope you are now rested and ready for the new year professionally! Just as we need to reflect on our personal lives, we also need to reflect on our professional life. How "healthy" are you at work? Do you need to spend some time cleaning up/out professionally? Do you need to trim the "fat" at the office? Do you say yes to too many projects or do you not say yes enough to learning "new" and improved ways of doing things? CASE can help you stay up on what is important and what is new. Connecting with your colleagues on issues and situations is a great way to "trim the fat!" Let CASE be your "go to" problem solver! Make sure you send us your ideas on better ways we can help you be the best you can be at your job! Use CASE to help you encourage and recognize your colleagues who do a great job! It isn't too late to either nominate someone for one of the CASE awards or to nominate someone to run for President Elect! Go to the CASE website for information on both of these! Don't forget one of the best ways to stay up on what is important is to attend the CASE professional development events. Doesn't sunny, warm, Orlando, FL sound like the place you want to be Feb. 24-26? 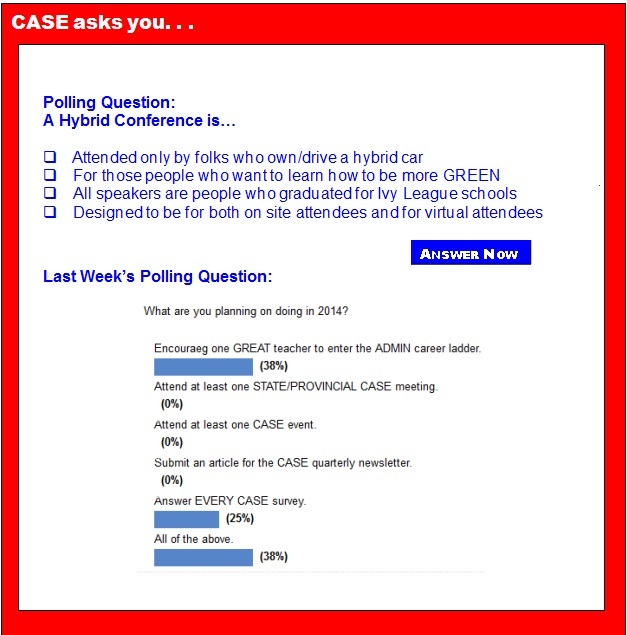 Or if you can't travel to Orlando, why not "throw a party" and host your own PD by being a virtual site for the 2014 CASE Hybrid Conference? Either way, you can register by clicking here. As a virtual site we will send you hints, an editable flyer and other support help! Let us know how we can make 2014 the best year ever for you and your team! Sponsored by Drexel University, join special education attorney Julie Weatherly and Key2Ed on Feb. 19-20 in Philadelphia for a unique two-day Conference on IEP Facilitation and its legal benefits in a small, interactive learning environment. The U.S. Department of Education has recognized IEP meeting facilitation as best practice through CADRE, and the American Association of School Administrators has recently proposed that the mandatory use of FIEP be included in the next Reauthorization of the IDEA. Disability advocates are protesting a move by the U.S. Department of Education that they say could leave students in the hands of poor-quality teachers. Students with disabilities in Hillsborough County, Fla., did markedly better than the national average of students with disabilities on the 2013 administration of the National Assessment of Educational Progress, also known as the "Nation's Report Card." Hillsborough County and 20 other urban districts have their scores reported separately, as part of the Trial Urban District Assessment, or TUDA. The special analysis of urban district performance started in 2002. Overall, scores on the TUDA were stagnant compared to the last time the tests were administered, in 2011. Personal technology such as iPads, notebook-size word processors and electronic pens that scan words and display definitions are helping Arizona special-education students keep up in class this year. The Arizona Department of Education has distributed a $265,000 federal grant among 12 school districts and charter schools that will study ways to better equip students with what educators term "assistive technology." Grace Ehmke, for instance, is on the honor roll at Mesa Public Schools' Pomeroy Elementary thanks in part to a $200 word processor called a Forte. On Sept. 10, 2013, police found Rebecca Ann Sedwick's dead body at an abandoned cement factory in Lakeland, Florida. The day before instead of taking the bus to school, Sedwick jumped off a tower and took her life at the age of 12. By the time of her death former classmates had been bullying her through social media for about a year with messages including "nobody cares about u," "i hate u," and "you seriously deserve to die." With states well into their final year of Race to the Top implementation, the 12 winners still have a lot of money to spend, according to the latest financial reports by the U.S. Department of Education. The state with the largest share of its award left? New York, with 59 percent of its $700 million still sitting in the bank as of Nov. 30, according to the latest federal spending report. Meanwhile, Delaware has just 31 percent left. Combined, the 12 Race to the Top states have $1.8 billion of their $4 billion in winnings left, or about 46 percent. The Obama administration's signature education-improvement effort was designed — for the most part — to be a four-year program. Awards were made in 2010. Disability advocates are protesting a move by the U.S. Department of Education that they say could leave students in the hands of poor-quality teachers. In a letter to U.S. Secretary of Education Arne Duncan, a coalition of almost 100 civil rights and disability advocacy groups including the Council for Exceptional Children, The Arc and the National Down Syndrome Society, among others, blasted federal education officials for what they called "apparent backtracking" on measures to ensure that all children have access to good-quality teachers. At McPherson Middle School in Kansas, special education students are getting the chance to develop work skills and job experience through a prevocational training program. The program is part of the regular special education class. Students perform tasks, such as shredding paper and stocking pencil machines while keeping track of hours and calculating how much they would be paid for doing those tasks in the workplace. Mary Jo Staab, psychologist at McPherson Middle School, said these activities help students develop "soft skills" like work ethic and punctuality. The sound of eggs cracking and timers clicking reverberate through room 506 at Coventry High School. The tasty aroma of more than 200 freshly baked muffins made by the special education class every Tuesday morning and is enough to capture the attention of anyone passing by. Every week, four students — Shannon Kenney, Marissa Lawrence, Cody Haupt and Cody Spears — are busy crafting the most popular Wednesday morning snack for students and staff at Coventry High. Those of us who have spent our professional lives as educators know that the most essential ingredient in learning is a great teacher; one who has the ability to engage students, to make math and science interesting as well as instructive and to make the lessons of history both fun and a foundation for our journey through life, making good decisions and learning from our mistakes. Extra opportunities for students to learn before and after school could help boost Iowa's graduation rate, according to supporters of a $1 million extended learning pilot project proposed for the state. The new program was included in a budget recommendation that Iowa Department of Education officials submitted in November to Gov. Terry Branstad. There's no word yet on whether the governor will back the measure, but proponents of the provision point to the request as evidence that support for out-of-school learning is growing in the state.